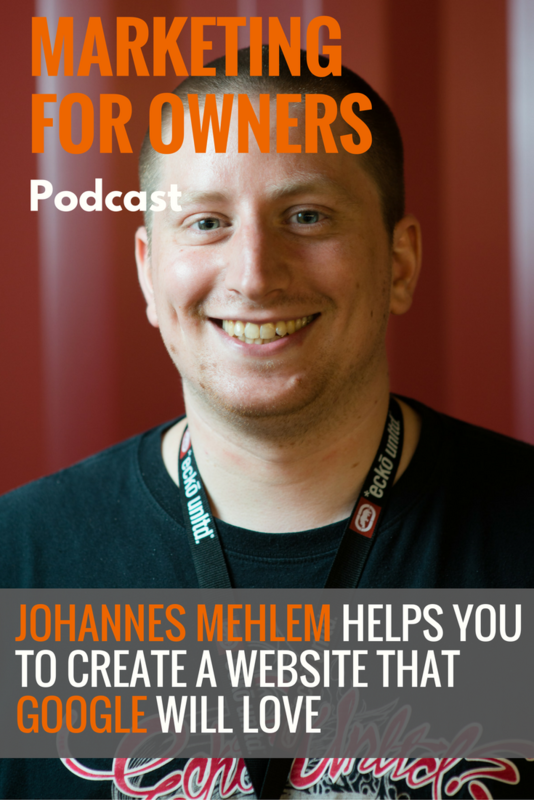 Back in 2004, whilst in a band at high school, Johannes Mehlem started to get an understanding of how to build and promote websites. At the time, it was to help spread their music, but it has since developed into a career in SEO. At university in Germany, he studied media managements with a major in marketing, and then ended up in Singapore for six months working for an SEO company. That’s where he earned a more in-depth knowledge by working with clients. After that, he went to the UK to study and ended up working at Google as part of their Product Quality Operations Team. With different teams for the different Google products, working around the world and in a variety of language markets, he helped in ensuring the user experience was second-to-none. Now, Johannes works for HubSpot in Dublin, where he oversees web analytics. So if anyone has any hope of helping us get our head around Google’s services, and to stay on its good side, it’s him. And luckily for us, Johannes has so really useful insider knowledge he can share with us. There are many parts to search engine optimization. On the one side, it is largely about the crawlability and discoverability of your website and pages. This ensures that the content is readable by the Google Bots, enabling it to be appropriately found and ranked. The lesser part is the offline SEO. By principle, Google is communicating a great deal with the off page parts of your website. Another important aspect is where Google draws the line. These are continuously being updated, revised and adapted. And the best place to go to figure out what is considered as spam is in the Google Webmaster Guidelines. Panda and Penguin are algorithmic filters which were put in place by Google to solve search and spam issues at scale. Since Panda rolled out in 2011, there have been many iterations which have become part of the core algorithm. It was created to tackle low-quality content which is thin and ad-happy. Penguin has also gone through many updates and changes since it was first used and has been specifically tasked to deal with websites which have low-quality backlink profiles. An example of a low-quality website is a news site without any writers or editors and just takes news from elsewhere on the web. Additionally, they are usually monetising the pages with ads. It’s the type of web result which many users would generally not be very pleased with if it were what came up in their search results. The data shows that since Penguin, there have been fewer attempts to do link spam of that type. But it could be considered that it has instead just caused a shift by the market. People are always just trying to adjust their behavior accordingly with the latest iteration of the filters. But that is partly why the Google algorithm changes twice a day. In reality, less than 2% of the 130 trillion pages indexed have ever been removed. This shows that genuine webmasters and business owners would never appear on Google’s spam radar. The people who do tend to own thousands of domains. In fact, you can see live examples of what Google classes as spam by visiting Google’s Fighting Spam page. A website producing genuine content, who isn’t involved in aggressive backlink building will always be okay. Google likes to mirror the real world. So when you have something to say, which is original, well researched, and hasn’t been covered by other people, that is valuable information, wherever you are. And it is those types of search results which Google is always trying to move towards. Even mediocre content is far, far better than spammy and rehashed content. When writing content, forget about trying to rank. Instead, just write content about your business and industry and it will come naturally. The reality is that it is almost impossible to rank on the first page of Google unless you’re in a niche or area with very little competition. And you should also think of links as recommendations in the real world. If the President of the United States gave you a recommendation, it is worth a lot more than if your next door neighbor recommended you. The Google Search Console Webmaster Tools offer an interface between your website and how it is perceived by Google. It is completely free and anyone can register their website. There are lots of courses out there to help you better understand search engine optimization. But with a lot of it, you can never be sure it is teaching you the things you need to know. That’s why Johannes recommends using Google’s Webmaster Academy. This will help you start with the basics, right from getting your own domain. And the Webmaster blog is a great resource for when you have the website up and running, wanting to use SEO tools and trying new things. Plus, it’ll help keep you up to date with the latest changes. Most people think duplicate content is putting the same post on your website and LinkedIn. However, Google algorithms are much better at detecting when that is the case, and won’t punish blogs for that. Instead, Google defines duplicate content as possibly being the same post on different publishers. As a result, Google will suppress the newer content copies in order to still provide unique results. However, people often try and get their content into wider audiences by sharing their posts with different websites. Their intention is genuine, and not to flood Google. To get around this, the next people using the content can use a rel=canonical tag to pass along the link juice. This will point Google towards your blog with the original post so it can rank the right version in its search results. Despite all their best efforts, Google+ never seemed to really take off in the way they wanted. And Johannes doesn’t think it worth focusing your efforts on. With your social media efforts, you are best only using a few chosen platforms. That way, you can be exceptional and very active on them, rather than try to spread yourself thinly. And when you review the other options which exist, such as Facebook, Twitter, and LinkedIn, his personal view is that Google+ isn’t worth including in your social media efforts. Generally, there are many great SEO agencies out there. Yes, anyone can call themselves an SEO expert on the internet, but a majority are very capable professionals according to Johannes. However, he has some useful advice when it comes to hiring one. Making the right decision comes down to performing the right reference checks and talking with previous clients. That way, you can be sure that you’re making the right decision for you. Taking time to make the decision is important because there can sometimes be a disconnect between the client and what the agency actually does. And be skeptical if you’re promised big jumps in Google, as these tend to not usually last very long. It is far better, and more natural, to make small and gradual gains. Johannes Mehlem is currently reworking his website to launch in April 2017 and is currently working on the content for it. However, if you’re interested in web analytics and how to make the most out of website data, this promises to be a worthwhile resource. So if you join his mailing list now, you’ll be among the first to know when his website is ready.